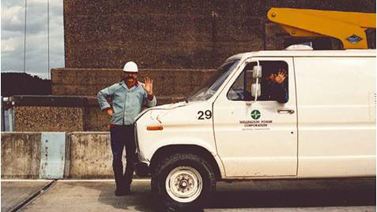 Wellington Power Corporation was founded and incorporated in Pittsburgh, PA in 1985. The primary focus of the Company at its inception was electrical construction. Wellington has since expanded its operations to provide services in data/communication systems and automated metering infrastructure in Utilities, Traffic Management, Commercial/Institutional, Mass Transit, Airport, Process and Treatment Facilities. Wellington Facilities Management, Inc. has performed technical services to operate and maintain the automated baggage systems as well as maintain the passenger boarding bridges and ground power units at Pittsburgh International Airport on a 24/7 basis. In June 2004, Wellington Energy, Inc., was formed to leverage the Company's addition of an industry leading automated metering infrastructure team. Wellington Energy serves the utility market focusing on automated metering asset management and transmission and distribution projects. In January 2011, Wellington Energy UK was added with its registered office located in Belfast, Northern Ireland and a representative office in London, England for the purpose of transforming Wellington Energy's significant US smart grid experience into value that could be recognized internationally in the UK, Europe and beyond. Wellington opted to create a new subsidiary in 2012: Wellington Constructors, Inc. The subsidiary performs specialized general construction infrastructure projects for aviation, transit and transportation. Wellington is certified as a Women's Business Enterprise in the State of California by the Public Utilities Commission - Supplier Clearinghouse and in the State of Pennsylvania by the University of Pittsburgh Medical Center and Highmark Health Systems. The Company consistently strives for continued growth in emerging markets and business opportunities.